Lifeline® Mouse Dendritic Cells provide an ideal culture model for the study of the initiation of immune responses, delivery of antigens to dendritic cells, cytokine production, vaccines, and Toll-like receptors (TLRs). Lifeline® Mouse Dendritic Cells are derived from the bone marrow of C57BL/6 mice and have been cultured with GM-CSF. Our Dendritic Cells are quality tested via flow cytometry to ensure proper expression of dendritic markers. 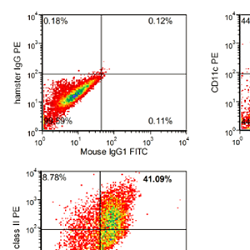 Dendritic cells express CD3, CD19, Class I MCH and Class II MHC markers.